In the 1840's, Turner switched from sunsets to sunrises. He purchased a number of houses on the water so he could watch the sunrise. He woke early to watch the 'yellow morning' invade the 'gray dawn'. The title of this piece, Norham Castle, Sunrise, the operative word being "sunrise", indicates Turner's desire to indicate a moment in time. He was more interested in the atmosphere created at this moment, than the actual physical objects of the place he felt so dearly for. As he painted this scene many times during his life, it serves as a fond recollection of an old man's youth. It is interesting to note that his final representation, as a man in his 70s, the objects become less clear and the atmosphere takes precedence. The castle all but disappeared; the cows serve as the only clue that this is not some other worldly dream destination, but an actual landscape. It seems our artist has come full circle. This was a scene that fascinated him in his early 20s, at the beginning of his career, and brought his work to a close as one of his last paintings. While on one of his many travels to Scotland, when his coach passed the castle his travel companion, Robert Cadell, noticed that Turner took off his hat and bowed. He explained his gestures, "I made a painting of Norham several years since. It took, and from that day to this I have had as much to do as my hands could execute." 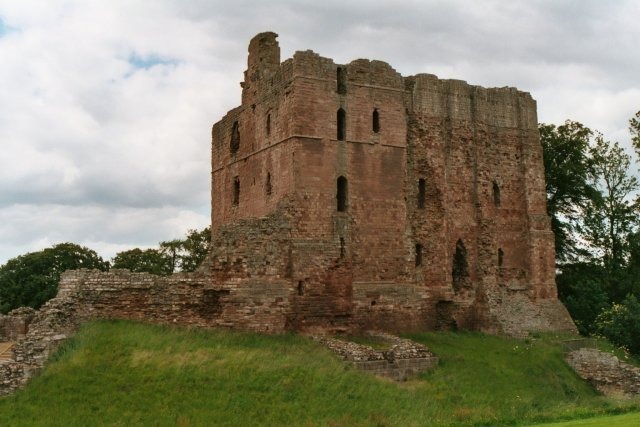 The Norham castle provided a source of unending inspiration for Turner. The first time Turner had seen the castle was during one of his many trips to the countryside in the north of England in 1797. The setting was so magical he could not forget it through the next forty years. He painted the scene four times and sketched it many more He felt, although unfinished, that this final attempt achieved the representation he desired. Turner was said to have represented the castle like no other before him. He found a beauty where no one else looked, painting an ordinary fog with a great cosmic effect. He recognized the fantastic that went completely unnoticed by most. He was inspired by the purple rocks, blue river pools, glittering trees and the endless hills that this setting had to offer. The sun shines brighter here than in previous paintings. Four canvases later the bright dawn revealed itself in all his intended and anticipated magnificence. Turner dealt masterfully with the composition of Norham Castle, Sunrise. He used lighting and a combined color palette to achieve a supreme and calming balance to this piece. With his loose signature brushstrokes he developed later in his career, he created a hazy atmosphere that only he could have achieved. The blue mass just off center represents the castle. It has quietly dissolved behind the haze, receding into the background. The brown banks on both sides of the canvas lead the eye towards the castle. The sunrises in a blur right above the castle also bringing it attention. The early morning fog lingers a little while before it runs away from the shining sun. The sun, unaware of its fleeting friend's reservations, continues to rise humbly, ready to share its beauty with the day. It is quiet here, and it is calm. All seems at peace. Nature remains unaffected by the quickly modernizing world just miles away. The effectiveness of the lighting in this piece was achieved through Turner's light and loose brush stroke. Had he practiced a tighter, more precise stroke the atmosphere wouldn't have been so elusive and hazy. Turner combines both a warm and cool palette in Norham Castle, Sunrise. The yellow sun takes presence in the cool sky. Its warm reflection encroaches upon the blues of the early morning fog. The brown on both sides of the canvas and the sun above form a triangle of warmness to balance out the predominantly cooler colored composition. As this was one of his later paintings, Turner focused almost entirely on the lighting of this piece. He wanted the atmosphere to dominate, to evoke the feeling he felt from seeing the natural sunrise, without the man made objects interfering. Despite the haze and fog, the sun rises and reflects mightily over the medieval castle. Norham Castle, Sunrise got the attention it deserved only after Turner's death. This painting was not released to the public while the artist was still living. It received a notable amount of praise during the early twentieth century and continues to attract reception of modern art appreciators of today. This piece was not released to the public as Turner felt it was unfinished. Though he wouldn't have dared exhibit an unfinished piece to the Royal Academy, it served as an inspiration for the later Impressionists who were often criticized for their "unfinished" paintings. One can only wonder if he had finished the work, if it would be admired as greatly as it is today. The 1906 Exhibition at the Tate Gallery in London marked the rediscovery of Turner. Norham Castle, Sunrise, along with twenty more of Turner's unfinished work were showcased to the public for the first time. Despite Turner's own reservations about his unfinished work being viewed, the onlookers appreciated his work as complete. What he felt to be the most important part of his work, the lighting, was still recognized as extraordinary, finished or not. The critic of the Spectator newspaper wrote, 'Turner in his latest development, more than any artist who had gone before him, painted not so much the objects he saw as the light which played round them. " Perhaps the audience gave such positive attention to the gallery because, as Sir Charles Holroyd, the Keeper of the Tate, mentioned the modern public was by now well enough educated to "appreciate what are called impressionist pictures." Throughout the twentieth century appreciation for Norham Castle, Sunrise continued to grow. It has continued to inspire artists and musicians. British composer George Benjamin's At First Light (1982) is a clear indication of this piece's lasting influence. 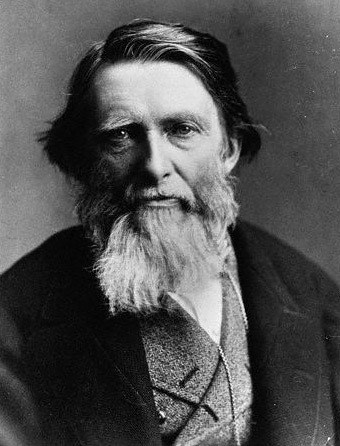 The influential English art critic John Ruskin described Turner as the artist who could most "stirringly and truthfully measure the moods of Nature. " Audiences today still agree with this statement. Art appreciators and critics alike flock to Turner's exhibits, Norham Castle, Sunrise being among his works that attracts the most excited attention. 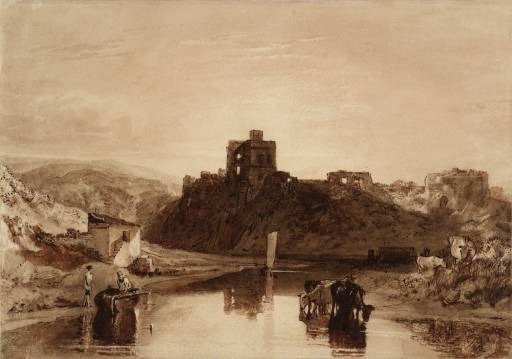 Turner visited the Norham Castle many times throughout his life. It was a place that held the fond memories of his youth and created new moments in his old age. 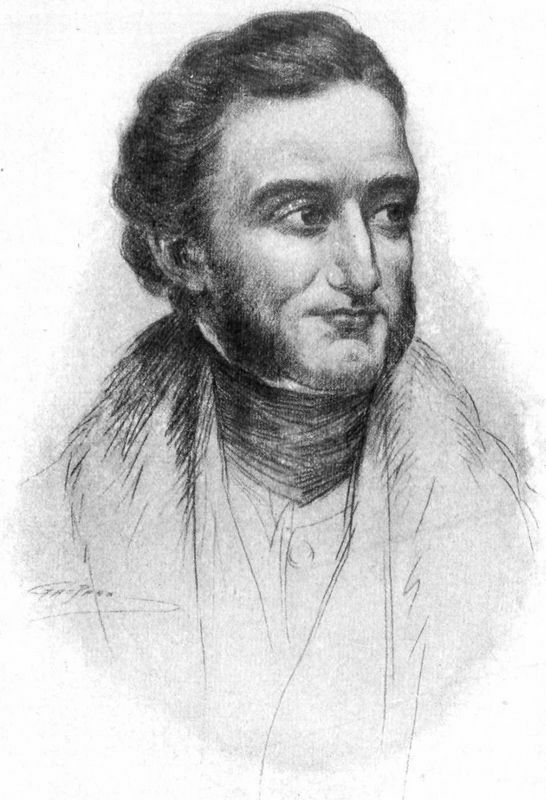 He first drew at the castle in 1797 at age 22, and exhibited his water color drawing the Royal academy a year later. He went on to sketch and paint this scene many times over, each work looking different than the next. This painting was the first of many depictions of the castle. This watercolour was used as the basis for an engraving in the Liber Studiorum, 1816. One can see a very detailed account of each entity in the piece. This is in heavy contrast with Turner's last interpretation, Norham Castle, Sunrise where the form of the castle is hardly distinguishable. Turner approached this Norham Castle painting differently than the Sunrise. This scene depicts the castle on the River Tweed which borders England and Scotland. The style he learned while painting with watercolors he later transferred to oils, giving his canvases a rare quality. Again in this painting the castle is clearly more visible and recognizable in shape, with clear and distinct human forms and landscape. J. M.W. Turner began his artistic career at a very young age. His success was fairly immediate, selling his first painting at just 12 years old. He continued to accomplish significant achievements at a remarkably young age and throughout his career he remained highly sought-after and acquired a very large fortune from his commissions. He is remembered as an influential painter, said to be the best landscapist of the 19th century, and a key artist to influence the Impressionist movement. Turner is famed for his original interpretations of bringing light and color to his canvases. 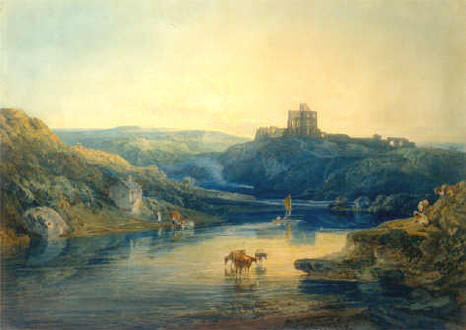 Turner never submitted Norham Castle, Sunrise during his lifetime but it is believed to have been finished around 1845. He was about 70 years old upon its completion. This was one of his last paintings, as he died just 6 years later. The Norham Castle was a place Turner frequented often and he first painted this subject in 1797 when he was just 22 years old. He exhibited his watercolor drawing at the Royal academy a year later. The castle was a place that held fond memories of Turner's youth and created new moments in his old age. Norham Castle, Sunrise received the attention it deserved only after Turner's death in 1851. It received a notable amount of praise during the early twentieth century and continues to attract the attention of modern art appreciators today. Romanticism is sometimes viewed as a reaction to its more serious predecessor, the Neoclassical movement. As Neoclassical artists focused on properly accounting history through a close attention to detail, Romantic artists flirted with themes of man's self glorification, man's part in nature, divinity found in nature, and emotion. Though Neoclassicism is generally associated with the history genre, Turner is credited with having embarked upon a subject matter so great that it actually rivaled the history genre. His subject matter accounts for recording history, but in a different style than ever seen before. He used color as an intensity of emotion to portray the passing of events. You can find out more about Turner and his fascinating works by referring to the many books listed in our bibliography and recommended reading list below. • Brennan, Matthew. Wordsworth, Turner, and Romantic Landscape. Columbia, SC. : Camden House, 1987. • Gage, John. Color in Turner: Poetry and Truth. New York: Frederick A. Praeger, 1969. • Lindsay, Jack. J. M. W. Turner: A Critical Biography. London: Cory, Adams and Mackay, 1966. • Turner, J. M. W. The Shipwreck. 1805.